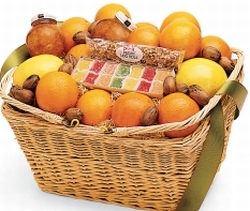 This gift basket has it all - about 15 pounds of premium Florida Citrus, candy, nuts and preserves. Includes authentic Florida Orange Marmalade, Orange Blossom Honey, Southern Pecans, Florida citrus juice Candy Squares and a Pecan candy roll. All in a distinctive blonde willow basket. Your choice of all Oranges or a mix of Oranges and Grapefruit.